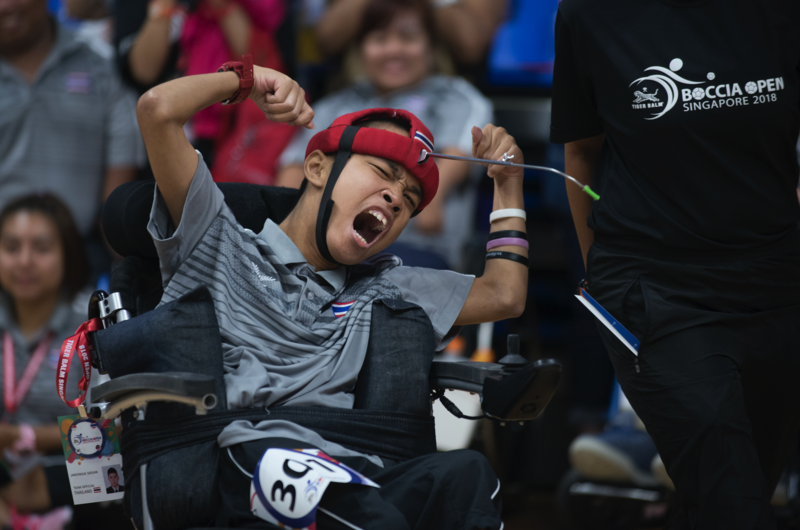 Boccia athletes from Thailand showed off their prowess on the regional stage as they took all the spots in the finals of the individual events. World No.3 in the BC2 category, Thailand’s Saengampa Worawut, moved on to the finals tomorrow after beating Malaysian Teri Dale Adelric 14-0. Worawut’s opponent in the final is compatriot Pachdee Boontep, who beat South Korea’s Shin Wooseob 10-0 in the semi-finals. Singapore’s Aloysius Gan, 12, the youngest athlete of the competition, gave the home crowd much to cheer about when he became the only Team Singapore athlete to qualify for the BC3 semi-finals in the individual event. Gan displayed grit and resilience as he came from behind 0-4 to beat Korean Woo Jeongmin with a score of 7-4 in the round robin stage. In the nail-biting semi-final, Gan again found himself down 0-3 early on against Thailand’s Poolket Pongsathorn. But Gan put up a good fight to reduce the deficit to 2-3. In the end, he lost the see-sawing match by a narrow margin of 2-4. Pongsathorn will battle teammate Kla-han Ladamanee in the final. Over in the BC1 category, it will be another all-Thai final between Huadpradit Witsanu and Deemak Nattawu. Organised by the Singapore Disability Sports Council (SDSC), the Singapore Boccia Open made its return after a 10-year hiatus, thanks to a S$70,000 sponsorship from Tiger Balm. Finals for the individual category will be played tomorrow morning.